The Cain and Abel quilt block is a five patch block as it is built on a 5 X 5 square. However, it is sewn together as an uneven nine patch as the construction is easier. This quilt block is one of a series of biblical quilt blocks. 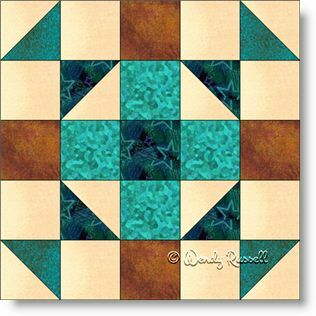 This quilt block is easy to make, containing only squares and half square triangles. I have included instructions for making four different sizes of this quilt block. The sample quilts illustrated show how different two quilts with all the same blocks can be when you create your heirloom.